Hand-made in the US, this 100% leather duffle back from North Carolina based Colsen Keane is slick. 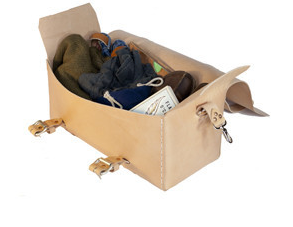 Built to hold enough for a short trip (2 pairs of shoes and 2 stacks of clothes), this bag (handmade in the US of course) features "some of the industries strongest leather", copper rivets, 3 buckles, and shoulder strap. Elegant in simplicity, it is a bit boxy, but it will get the job done. Purchase here.